Three years ago I would have never ever even thought about going to a dog park, but three years ago I did not have this little face to wake up to every morning. I love my dog Kia Louise. She makes me smile every single day. You fellow dog lovers know what I am talking about. Let’s get together for tea and talk about our dogs for hours, shall we? The flip side is true too, though. When she needs to move, she needs to move and her favorite thing to do is to run. That is why we found the dog park. Brian taught her run after the ball and return it and that is what she does. Over and over and over and over again. Her running is a thing of beauty. She goes for it, full throttle. People look at her in amazement. They comment on how fast she streaks across the park. Brian and I watch her and smile at each other. She’s amazing. She’s our girl. I can honestly say that the dog park is one of my favorite places to go. We have a beautiful one here in town. What other place can you go to see so many different dogs, running and playing together? Most come up for a reassuring pat or a rub behind the ears. Cassandra. She always comes over for some Betty Love. Best of all, we’ve made friends at the dog park, and Kia has made a best friend. 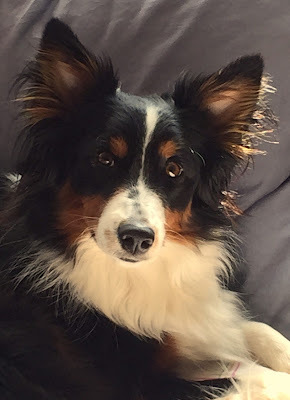 Hazel, an Australian Shepherd and her family are now a large part of our lives. Kia goes to Hazel’s house for play dates and stays overnight when we are out of town. Hazel spends every Friday here while her parents work and many Saturdays. Kia and Hazel love each other very much. Three years ago, when I found Kia at the shelter, she was alone, scared and wondering if she would ever find a true home. Come to think of it, she found me when I was feeling the same way. Now here we are, safe, secure and surrounded by love, both of us stronger than ever. 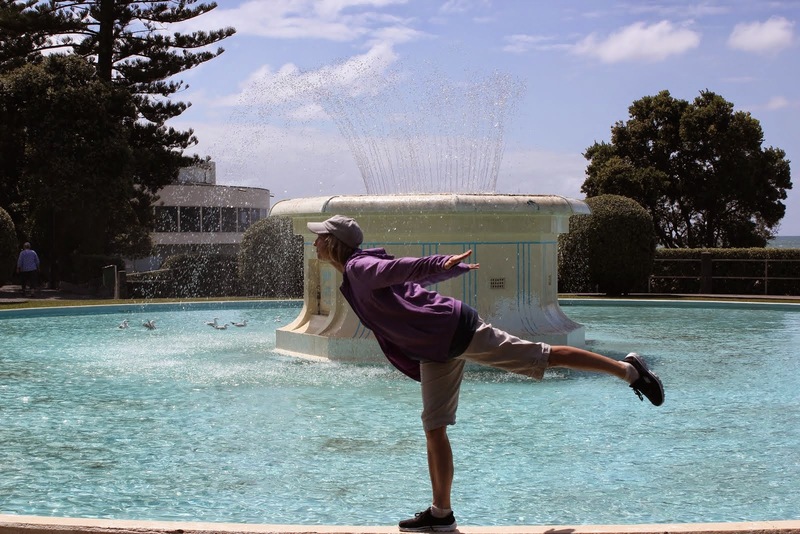 It’s amazing where life takes us, isn’t it? 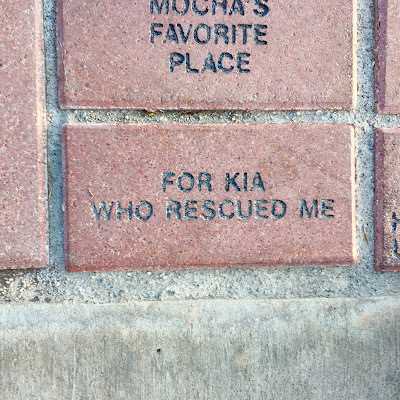 Kia did come into your life at just the right moment. Cool she has a buddy. They are cute together. I know what you mean about dogs who are on or off only. When they're on, they are warp nine. Kia has such a sweet face. She looks quite happy spending time with her friend Hazel. 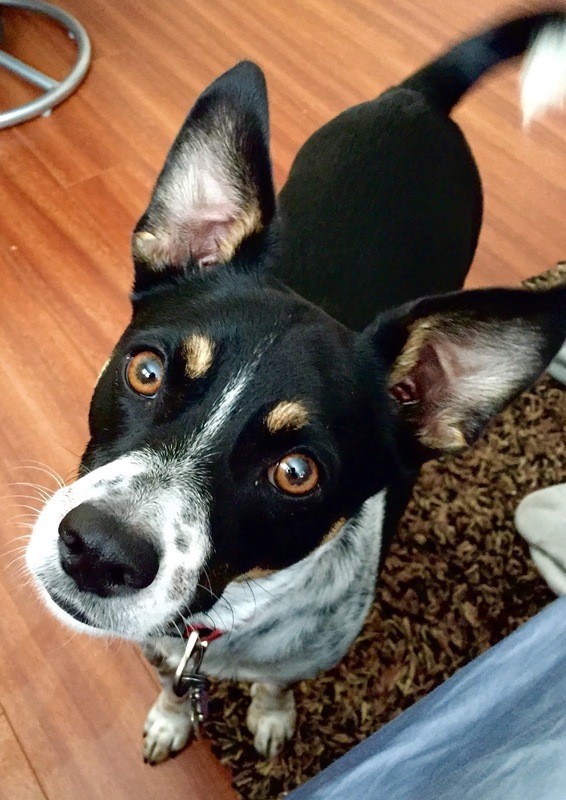 Rescue dogs are the best! I'm glad you and Kia found one another. Love this, Betty . . . especially the last two lines. Big time. Hugs, my friend. Yay for dogs who are rescued and who rescue. 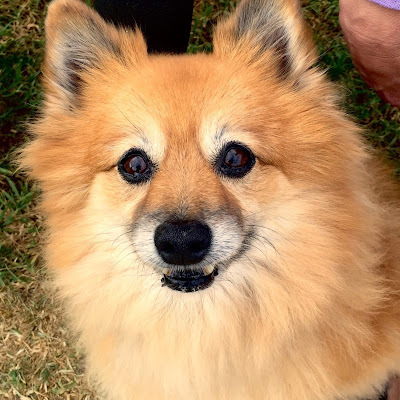 BB OH MY STARS, STRIPES AND CATS AND DOGS WE ARE SOOO VERY HAPPY TO HAVE ANOTHER TIDBIT FROM YOUR BUFFET OF KIA. Kia has blossomed with the love of you and Brian. I can nearly see her streaking across the park in glee. Now let me just say the fact that Kia has a bestie. Everybody needs a bestie! 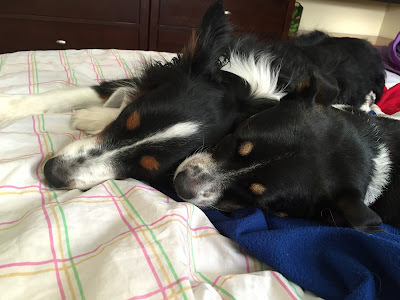 !The best news and such an accomplishment for Kia and Hazel and they have sleepovers. How sweet...you know they kinda look a like!! 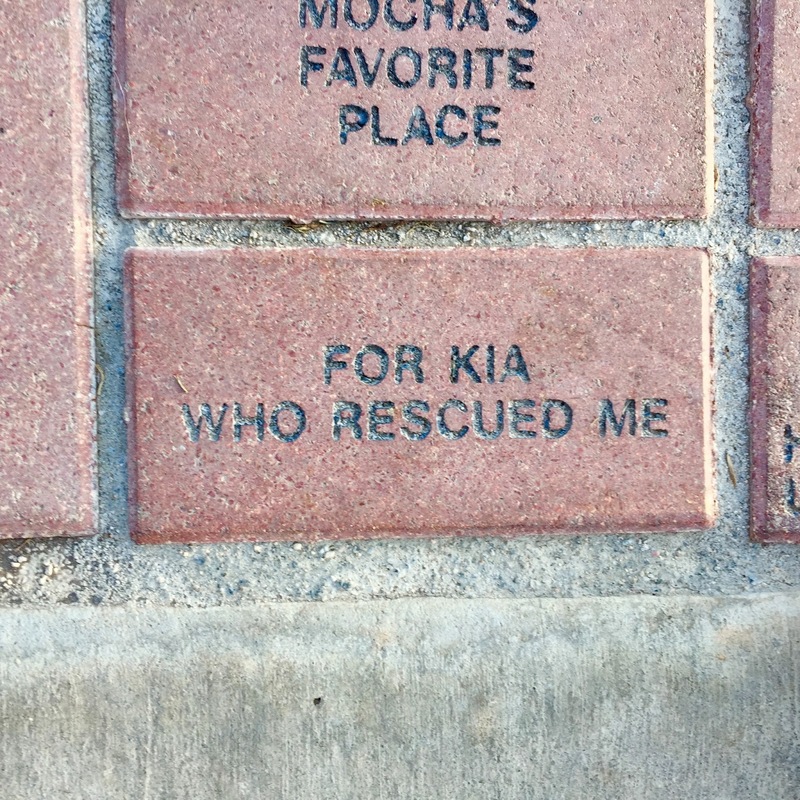 PS We love the brick in honor of Kia!! Hi Betty! Loved this post. Loved the brick and loved the pictures. So nice to see you again. 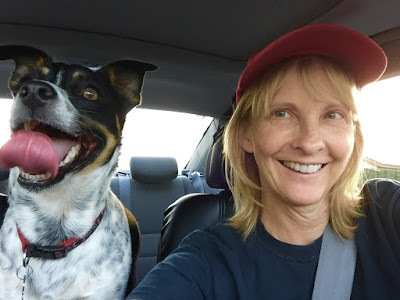 Kia does look rat terrier to me, much like the dog I had as a little kid. I love doggie piles pictures, alas my husband won't let me get another dog and I agree another 100 Labrador is too much but a 20 lb lap dog would be nice to cuddle with. Oh, the love of a dog! I miss that terribly! 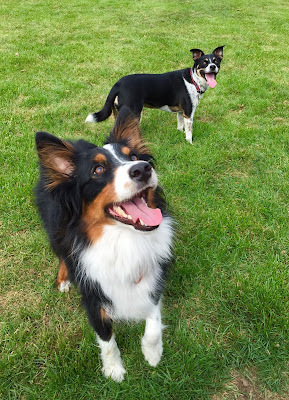 No surprise that your wild and crazy dog befriends an Australian shepherd which is also high energy. You will stay thin. Oh, much the same here. about 3 months ago a little puppy showed up in the yard (out in the country, people dump dogs here frequently) and would not leave. She is 6 months old now, we know because she has been getting her adult teeth in. 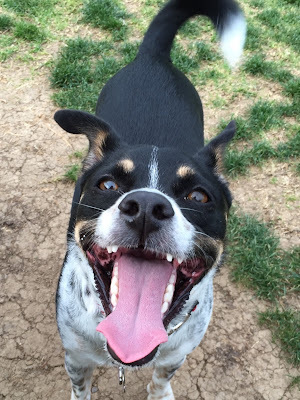 Also part rat terrier (and part chihuahua the vet thinks) and fast as lightning. runs full out. or flops, just like Kia. Aw. What a great friend you both have! And how lucky you are to have found each other just when you needed it. Good to see you both so happy. I had a rat terrier once--awesome dog! I have never been to a dog park. They opened a new one in my old area of town and I was constantly seeing dog attack reports. People would take pitbulls and those types of dogs and argue, "Mine isn't dangerous" and get mad when people profiled their dogs as dangerous. Maybe not all pitbulls are dangerous, but I think I'd just rather not take some owner's word for it! Plus...the more reports rolled in about dogs being attacked, the more I decided it wasn't for us. That part of town was kind of questionable. We're in a safer part of town now where dog owners have a little more common sense (or so I hope!). Awww, beeyootiful! Yes, I do understand. And I'm a little jealous of your co-parenting setup with Hazel's family. That's got to be a win-win-win-win. She looks like both a cutie and a character. I'm glad that the two (make that three) of you found each other. You said a lot here. 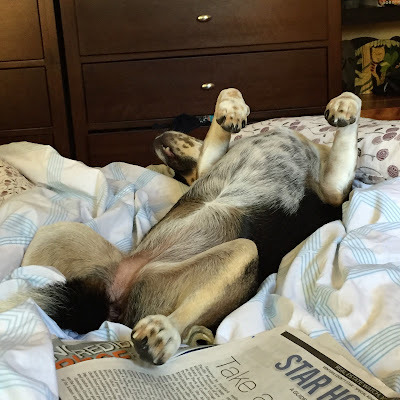 You said things many of us have felt about our dear furry family members. MERRY CHRISTMAS AND HAPPY NEW YEAR TO YOU BB AND YOUR ENTIRE HOUSEHOLD. Miss your sunny blog, but I haven't been writing either...so I won't say anything other than I hope you are doing fine! Hugs! hi betty, i hope you're doing well. you've been missed.